Installed new Fluidmaster fill valve and flapper but water still runs. Discussion in 'Toilet Forum discussions' started by Heather Henry, Apr 14, 2019 at 7:08 PM. My toilet was running occasionally so someone installed a new fluidmaster fill valve and flapper and now it runs almost constantly. Every five minutes there's a gush of water and it's constantly trickling into the bowl. with the research I've done it makes sense that it would be the flapper but again it's brand new. Is there something they could have done wrong while installing it? How high is the water in the tank, compared to the overflow, when the fill valve turns off? Is the hose from the fill valve held over the overflow with a clip, or does the hose go down the overflow? If you turn the stop valve at the wall off, how high is the water in the tank an hour or so later? The hose goes a lot farther down the overflow, the last one was held on by a clip. I have tried pulling it up and just placing it on that clip without the lid on but I still get the gushes of water. Yesterday when I turned the water off the tank definitely lost some water. You can see it trickling in the bowl constantly when the water is on. I also did the red dye test, but I didn't see red water in the bowl. Ok. Wipe the seat for the flapper with a course cloth. The seat may have a piece of debris that is preventing a good seal. Make sure there is a small amount of slack in the chain. The pictures don't show the bottom of the chain. There could also be damage to the seat, which you could feel. Replacing the whole flush valve could be a cure. The fluidmaster555C - UNIVERSAL FLUSH VALVE REPAIR KIT glues onto the existing seat, and that is easier than replacing the whole flush valve. If you need to use a plunger now and then, you could consider replacing the toilet. Most of the new ones flush better than the older designs despite the change in gallons per flush. Ok, I will try these things. The chain is not too tight. I even unhooked it and still have the same problem. I will also look up the flush valve kit you suggested. We definitely could use a new toilet, but we rent and I'm sure replacing the whole toilet is not top on his list. If your renting who pays the water bills? Turn off the water and see how low the water disappears in the tank. That will tell you where the leak is. 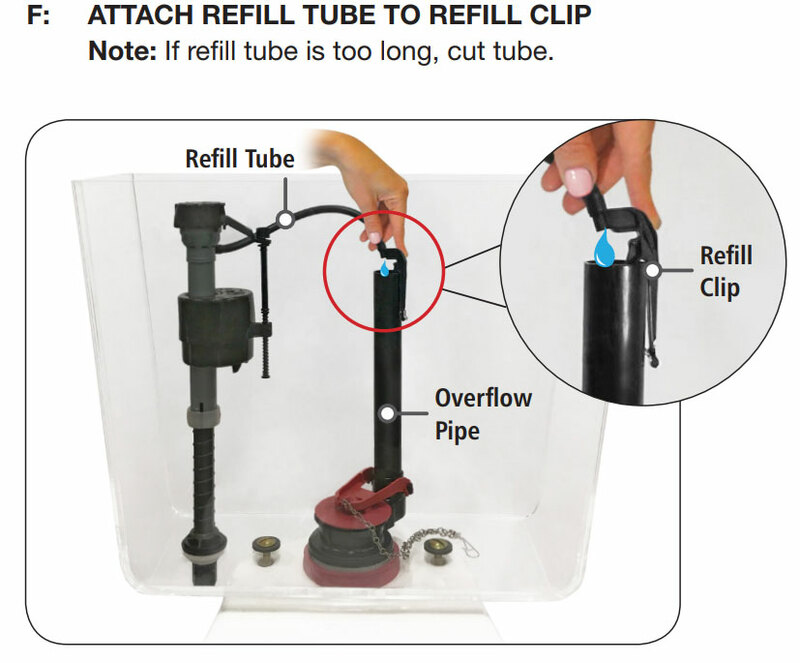 Make sure the refill tube does not go down the overflow tube. There needs to be an airgap. I think I may have found the problem. The part that the flapper goes onto appears to be broken... Uneven, which I'm assuming would cause a pretty big leak in the water. I've attached the picture. what is this / called and does the whole tank have to come off to replace it? That is the seat of the flush valve. It looks like an old 2-inch flush valve. To replace the flush valve, the tank must come off. If you ever need a plunger, when going to that much work, I would suggest a good new toilet will make you not have to use a plunger hardly ever, and save water as a side benefit. I think you have good info to discuss with the landlord. You have for sure identified the problem. To use one of the glue-on fixes, you would have to smooth things with a file or other tool first. Also a fair amount of work. And even then, is it smooth enough for the glue to seal? That's what I was afraid of. I was hoping I could fix it myself. Can't tell from your picture, but some flappers have both a ring that fits over the overflow tube, and ears that fit over lugs on it. If your overflow has lugs, and you also use the ring, that can distort the flapper and make it leak. If you have lugs, cut the ring out if it's there, so it's not being used and see what happens. It should be one or the other, not both. Home Depot sells a flush valve seat repair kit that you can put over to avoid the hassle of having to remove the tank or disturb the gasket between the tank and bowl. If it doesn't work out, the leak would be tank water into the bowl. As long as you don't mess with the tank gasket, then if there's a leak that causes a water damage due to that gasket, liability stays with them, not you. I wouldn't use it in my own home; but if I was a renter and had to deal with a slumlord, then I'd use it.